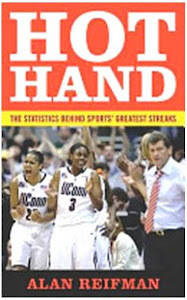 Today marks the 10th anniversary of the launching of the Hot Hand in Sports website. The page has gone through a few different looks, as shown below. From 2002 to 2006, I used just a very basic FrontPage HTML format for the site, which was hosted on my college's server at Texas Tech University. In 2006, I transferred the site to Blogger/Blogspot, where it has remained ever since. However, I've changed the template somewhat during the past six years. Here's how the page looked in its early years on Blogger. Finally, 2011 and 2012 have brought major new developments. The book Hot Hand has now been published (see upper-right column). Also, I have started issuing brief updates on streaky performances right as they occur, via Twitter (http:/www.twitter.com/alanreifman), reserving the blog for more elaborate analyses. As long as athletes keep going on streaks and I enjoy writing about them, this blog and associated activities will keep on going!